This past weekend we traveled to Palacios Yacht Club for a combined adult Laser District 15 and youth Cannonball Run (Opti/4.7/Radial) Regatta. Normally, there is no mixing of youth and adult regattas and I'll admit I was a little skeptical about the concept but it turned out to be a brilliant idea to combine the two. It's definitely a model that should be considered for encouraging and building participation. It somehow provided the perfect push/pull for both the sailors and the parents in attendance. Palacios is located in Texas part way between Galveston and Corpus Christi and the "yacht club" appears to be wherever the members hang their sign and boats and people gather. They proved that with community support and lots of awesome volunteers, you just don't need a clubhouse to put on a great event. There was plenty of wind, sun and heat for the weekend. Hydration, sunscreen, fitness and a little fearlessness were all definite musts for racing. I registered which helped get the numbers where they needed to be to qualify the event for grand prix points but I took one look at the conditions and opted out of sailing. 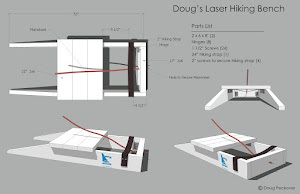 That would leave Doug free to focus on his own sailing and not have to worry about me. One of the goals for the mixing of adults and youth was to encourage kids and parents to both race. There was certainly no shortage of race saavy parents on hand. However, I suspect that many parents made the same choice as I did but made it earlier, deciding that the kids had priority. In less challenging and more controlled conditions, I could certainly see more parents (and spouses) opting in rather than out. After helping Doug drag his dolly through the sandy beach (no small task) and getting him launched, I got back up to the parking lot and turned around and he had already returned. He hollered that the pin on the vang had broken (same thing happened to Sebastian between races but he carried a spare pin in his life jacket which Doug now has too). I grabbed the gear box and ran toward the beach, fished out another pin and for the life of me all I could see were those little 'I hate you' ring dings that would just about fit the pinky of a four year old (who can use those things?). I just pulled my ring off and used that instead. Quite handy. As I was standing on the beach watching him sail away, a parent jokingly asked me if I'd gotten my boy off safely. I laughed as I looked around and saw all the parents up and down the beach doing the same thing. So that's what I'd become … the parent of a sailor. More than once, as I looked out on the racing, I was asked which course my kid was on. When we first arrived, I parked (temporarily) right up front. After a while we were sort of boxed in and couldn't move but by day 2, upon realizing that 'my kid' was the oldest kid on the race course, I declared the spot the 'Sailors Over Sixty parking' and just claimed it as ours. It was an interesting weekend of contrasts. Most of the young sailors put up their sails really early letting them flog in the wind. The older sailors (who bought their own sail) waited until the very last minute. When returning to the sandy beach, there was an arduous hike through the sand to get the boat to the parking lot and water hose. The kids, without thinking twice, headed to the water hose with boat in tow, most of the time requiring multiple adults to help push and pull. The adults helped a few kids, then just walked to the water hose without their boats and stood under the water to cool off. Then they changed, grabbed food and water and debated whether they really needed to drag the boat off the public beach and rinse it off and put it in the parking lot. I didn't make it off the shore so haven't a clue about the racing. Several sailors left the course early and I was told I made the right decision not to sail. Watching the Opti kids come in was a hoot. One father was in a kayak and his daughter was following him in her Opti. He'd call out 'tack' and round she'd go. He talked her all the way into the beach and she calmly did everything she was told. When she got out of the boat she was just a tiny little thing and I was all choked up from watching her. Just amazingly precious! The funniest thing I noticed several times was when a kid was actually pulled off his Opti and the boat towed back in, no matter where that Opti was, the kid placed himself on the motor boat at the furthest distance away from the Opti. 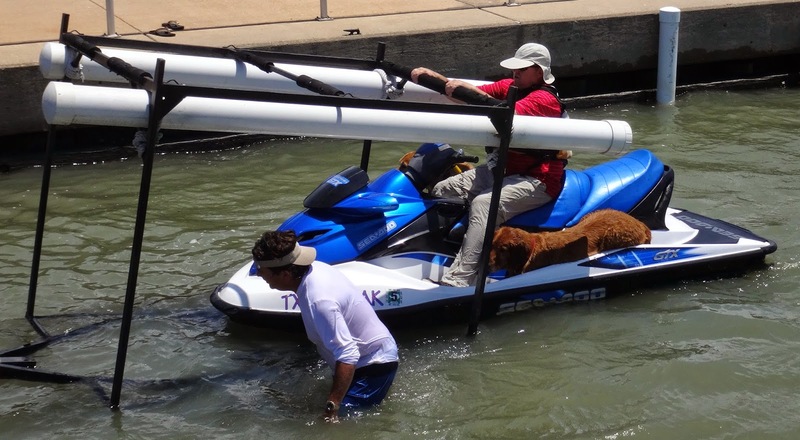 Now the dedication of one parent, who's kid schooled 'my kid' all weekend, was so determined to see the racing that he and another fellow and two large dogs (all without life jackets) jumped on a two seater jet ski and headed to the race course. That was definitely a sight. I understand the jetski had some issues and they were towed back in. 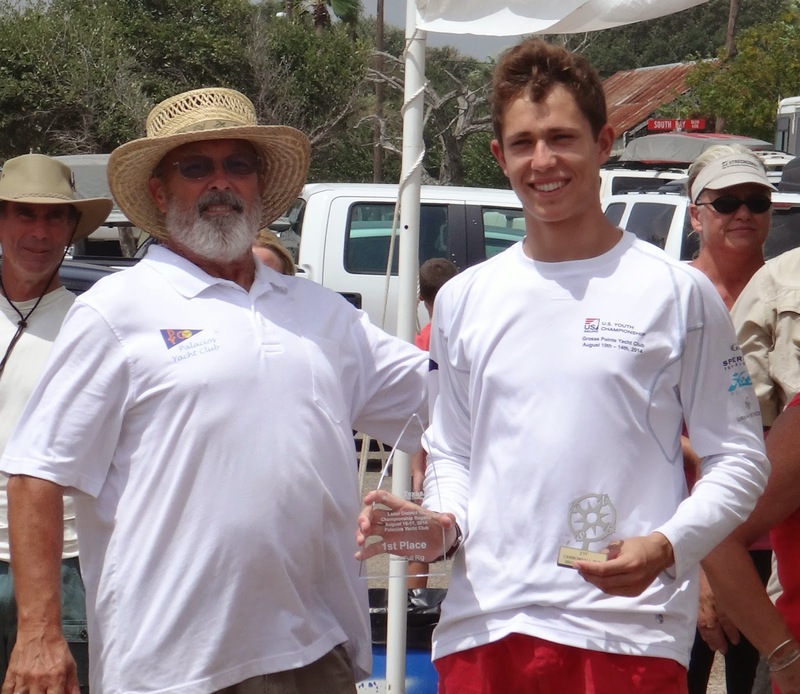 At the end of the regatta, 18 year old, Keen, had soundly and repeatedly beaten Doug and thrown out a 1 in the final scoring. Although the two were usually separated from the pack, Keen was clearly the better sailor. Keen sat down to dinner with us on Saturday evening and there was an interesting exchange. Weight - Keen is a few pounds lighter than Doug. Age - Doug is 4 and half decades older than Keen. Doug assumed Keen was heavier and Keen assumed Doug was younger. Their sailing speed was similar upwind with Doug getting to the first windward mark ahead of Keen about 4 out of the 7 races but Keen was much faster downwind. Keen's observation was that all of Doug's controls were too loose. Keen's coach, Ryan Minth, has his students sailing with tighter controls upwind than anyone else. 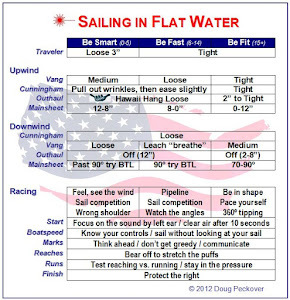 So, on day 2, Doug sailed with his controls on harder but it's going to take some time for fine tuning. 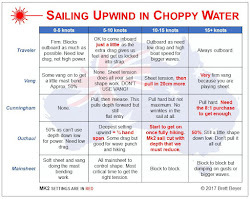 Doug thought the boat felt more balanced and more responsive but it also felt like sailing a Radial coming off the start line (no power). Keen's downwind concentration was such that he didn't really pay attention to Doug so he didn't have any advice to offer. So far, the most impressive downwind speed that Doug has seen in the area comes out of Houston. Hopefully, Doug will get a chance to get down there before the Worlds and let those kids (and Ryan) teach him a thing or two. Yet another precious moment was at the end of the regatta where there was a 50 pound kid struggling to pull an Opti with about 60 pounds of water in it and Doug felt compelled to go lend a hand. It made Doug's weekend. Are there any decent hotels in Palacios these days? Many stayed at the Luther. Heard some kids had a ghost app on their phone and were hunting ghosts. They got about three steps up toward the third floor and I guess the app said 'run' because they came flying back (or so I was told). A couple of Houston sailors got a decent room late Saturday when they decided not to drive to Houston and back. Don't know where it was but it was close and they were happy. Doug booked us for a historical adventure in Blessing in a hotel built in the early 1900s ... community bathrooms ... brought back the days of growing up with 6 kids in the house.